Stardust's is a family owned rabbitry and caviary located in Southern NH that prides itself on breeding top quality, friendly, and healthy animals for the show ring. 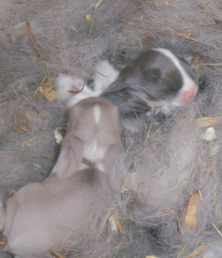 Stardust's started in 1997 with a few rabbits and cavies. We have changed a lot over the years, but our commitment to quality and care is the same. We are currently focusing on Mini Lops, but occasionally offer English Lops, and Netherland Dwarfs. We are active in our local 4-H (Great Scott's 4-H Rabbit & Cavy Club), the Essex County Rabbit & Cavy Breeders Association, and the American Rabbit Breeders Association. Our Mini Lops are actively shown and we are working hard to bring in new colors and patterns, such as Blue Eyed Whites, Vienna Marked, Chocolates, Tricolors, and Shaded colors. We added our first English Lops in the summer of 2011, and are currently working on improving our herd of this amazing rare breed! We love their goofy personalities, large size, and sweet demeanor. If you have questions, please don 't hesitate to contact us. We will gladly provide information about rabbit and cavy care, 4-H, and rabbit adoption! Feel free to friend us on Facebook, email (jbarbaro01@northshore.edu), or call (508-527-1408) for any questions.